The classic rum daiquiri is a favorite cocktail and the most popular variation of it is the strawberry daiquiri. 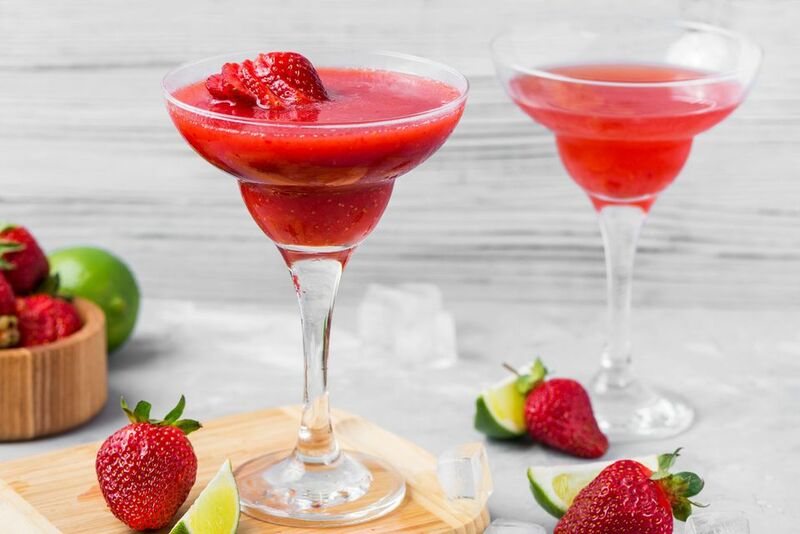 It's a drink that you can enjoy either frozen or shaken and when made with fresh strawberries it is one of the best drinks for spring and summer. Most often, the strawberry daiquiri is served as a boozy, fresh fruit smoothie. When the temperatures begin to rise, few sounds are as soothing as the blender whipping up a fresh batch of daiquiris. You just know something great is in your future. Though the blended version is more common, the shaken strawberry daiquiri is just as delicious and it's a little easier. Everything we love about this tropical drink is included—rum, lime, and fresh strawberries—there's simply no need to drag out the blender. Whether you blend it or shake it, a made from scratch strawberry daiquiri is sweet and refreshing. It's the perfect cocktail to cool down with on the hottest of days. Blend well at high speed until smooth. Pour into a chilled collins or margarita glass. Feel free to use either fresh or frozen strawberries for this cocktail. If you are making a frozen daiquiri, the frozen strawberries may be more appealing to work with, since they are already cold. If your drink is too thin, add a little more ice and blend again. Too thick? Add a splash of liquid and blend. Everyone has their own personal take on the strawberry daiquiri and both of these recipes are very basic and meant to be played with. Add your own personal spin by choosing a specific rum, adding more fruit, or tossing in some other "secret" ingredient. For instance, some people prefer a spiced rum because it gives the drink more background flavor. You might also add herbs like rosemary or basil, both of which pair perfectly with the berries. Those can be incorporated into the muddle, blender, or you can use a flavored simple syrup. Make a shaken strawberry daiquiri. When it comes to the shaken strawberry daiquiri, you can serve it "up" or over fresh ice. Either way, the trick is to keep it nice and cold by starting out with a chilled cocktail or margarita glass. Since we're working with fresh strawberries, you will find it best to fine strain this cocktail. To do so, simply place a fine mesh strainer over your glass as you're straining. This should keep all of the strawberry chunks and most of the tiny seeds out of your drink. It is also possible to make this daiquiri with a strawberry liqueur. Begin with 1 ounce of liqueur and adjust it to suit your taste. Muddle 5 or 6 sliced strawberries in a mixing glass or cocktail shaker until crushed and most of the juice has been released. Pour in 2 ounces light rum, 1/2 ounce fresh lime juice, 1/4 ounce simple syrup, and fill the shaker with ice. Fine strain into a chilled cocktail or margarita glass and garnish with a strawberry. Fresh strawberries are preferred for these drinks. They are available almost year-round and at their peak from April through June. There is also something special about strawberries from your own garden or the local farmers market. If you are a strawberry daiquiri lover, take advantage of these opportunities when they come up and enjoy the best drinks of the year. Be sure to properly wash and hull fresh berries before mixing them into any drink. Frozen strawberries are good as well, especially in the frozen daiquiri. In fact, some drinkers prefer to use them because they make the process just a little bit easier. The frozen strawberry daiquiri recipe uses an orange liqueur. While triple sec is the most common choice, you may want to play with some of the other options available. A quick upgrade would be Cointreau, and Grand Marnier adds a nice flair as well. If you have the fresh fruits on hand, save some and have fun with the garnish. They can be cut in many different ways or you can always simply cut a slit in the berry and slip it onto the rim of the glass. For a quick and beautiful garnish, cut a strawberry fan. It's incredibly easy to make and looks great on any glass. The thin slices rest perfectly on top of the frozen drink or one served on the rocks. Rinse the strawberry and remove the green stem and cap. Cut 4 to 5 thin slices lengthwise while holding the berry together. When you're ready to garnish the drink, simply spread the slices out on top in a fan shape. How Strong Is the Strawberry Daiquiri? While one drink is a little weaker than the other, keep in mind that both can sneak up on you. This is particularly true if you're enjoying a few daiquiris on a hot day in the sun. Be sure to drink plenty of water during the party so you don't get too drunk too fast.